One of our favorite warriors across baseball has reached a milestone, a night after Adrian Beltre reached the same. He’s 32 years old, and he’s at 400 career big flies. We’ve always loved the way he’s seemingly quietly gone about his business, overcame the same issues that we all as humans face, played hurt, and just generally went out and mashed. We’ve all heard the stories of 17-year old Miguel Cabrera down in Venezuela, hitting bombs off big leaguers who were throwing inside on him to intimidate the young man, only to offer him something soft and away that he yanked out of the park. He’s cut from a different cloth, you see. 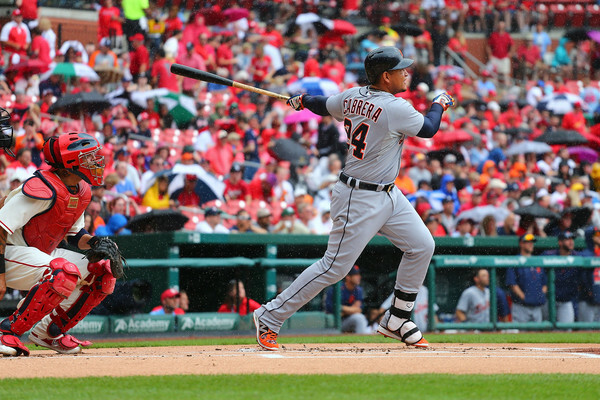 Miguel Cabrera’s come along once every 30 or 40 years. Or maybe once in a lifetime. Sometimes a guy like Cabrera gets overlooked because of the Harper’s, or Trout’s, or Bryant’s. It shouldn’t be that way. When it comes to yoking a baseball – the one he hit today was a blast to dead center in the heart of baseball country, St. Louis; in the rain – there isn’t a man alive who has a more sound fundamental stroke. And good for the Tigers on beating those rotten, luck-box Redbirds 4-3 in ten innings for the second straight day.